In the last post I had just painted the sides and the stern gallery of the 74. 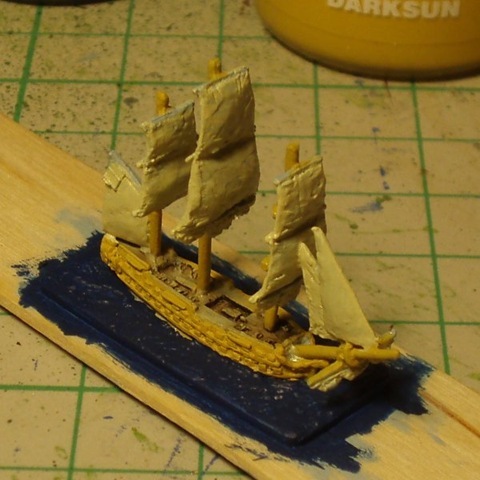 The next paint applied was Regal Blue to the sea base then I applied Bleached Bone to al the sails. 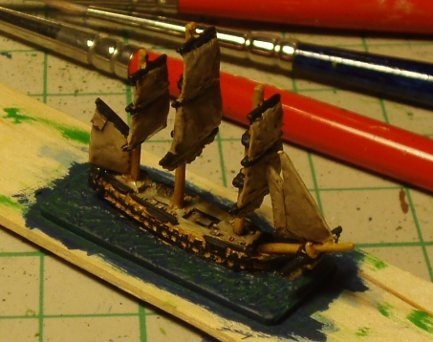 If you followed my painting of Figurehead’s 1/6000th ships in an earlier post here, you’ll remember I was using Vallejo’s Dark Prussian Blue as the base coat. Citadel’s Regal Blue is also dark but it is a richer blue so gives less depth to the sae base. The next time I paint these vessels I’ll do the sails at the same time as I do the deck, especially as the wash that I will use on the sails later is the same as the one I use on the deck. At this time it is easier to start to see how the vessel is going to look when it is completed. The next steps were washing the vessels sides and masts in Gryphonne Sepia. 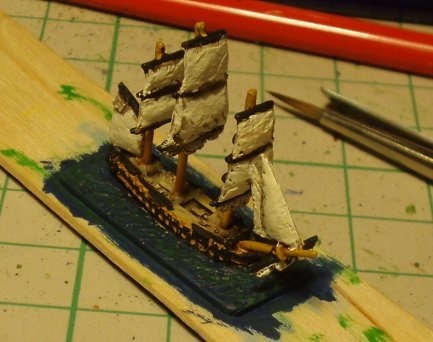 The sides of the hull were then dry-brushed with Bubonic Brown. I am thinking of skipping this step next time and wait until after the black has been painted on the sides before going back over the area washed. 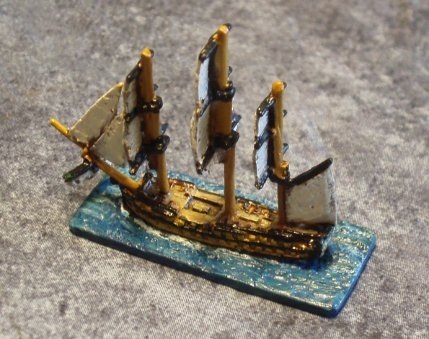 The bulwarks, strakes, windows and spars were painted black as well as the areas on the mast where the masts are joined and the lookout positions were. 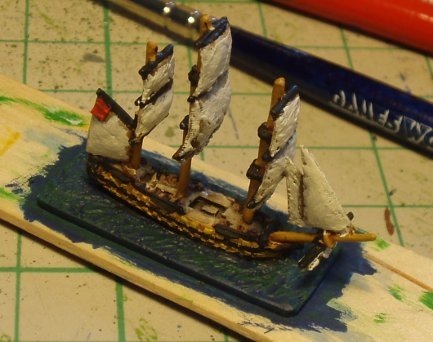 The next step was the painting of the sails and another coat of paint on the sea surface. The sails were washed with Devlan Mud to pick out some of the rough spots on it. It will be painted again later. It’s possible as well to see the effect of the snot green on the water as it lightens the Regal Blue. 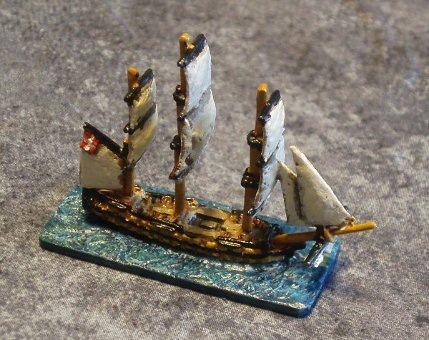 The sails are now given a kind of wet dry-brush of a mix of skull white and bleached bone. This gives the sails an appearance of weathered canvas. She is looking more a ship of the line now. 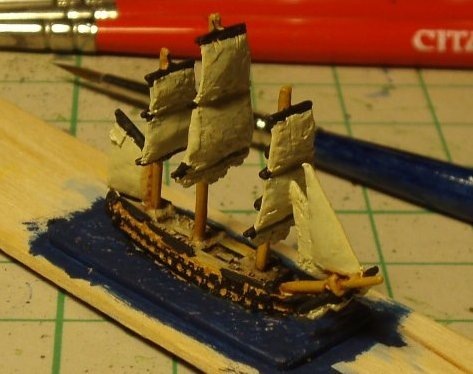 The next step was to do a number of small fiddly bits to the ship. Bestial Brown was used to paint the 14 guns visible on the deck. The deck itself was touched up with Bleached Bone and Devlan Mud wash. Mechrite Red (another foundation colour) was painted along the inside of the bulwarks as well as the ensign. When this was dry, Blood Red was painted over the Mechrite Red. Black was then used to touch up the bulwarks then paint the guns on the gun carriages. The photo to the left shows the ship at this position. It is all but finished at this stage, just requiring a little work on the sea surface and the ensign. Hawk Turquoise was then dry brushed over the sea surface and a final dry-brush of white was applied over the Hawk Turquoise. I wasn’t happy with the sea surface at that point as it appeared too white so a further dry-brush of the sea was made, this time with the Regal Blue again. The white in the ensign was painted. I then used a satin varnish to protect the model and when dry, it was finished.